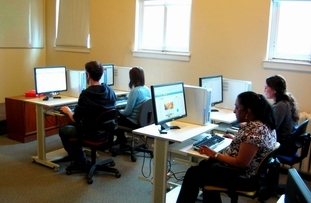 The Computer Classroom is an intimate space for activities that require access to computers and a personalized teaching or working environment. This second-floor room has eight workstations equipped with large flat screen monitors, 4 GB RAM, and Solid-State Drives for speed. Each computer is installed with Windows 10, Windows Office 2016 Professional software, and the Adobe software suite: Photoshop, InDesign, and Illustrator among other programs. All computers are connected to the internet with high-speed ADSL. A separate instructor’s workstation is fitted with a digital projector to enable the teacher’s desktop to be displayed to the entire class.